Bardolina 2, the nine-year-old Holsteiner mare ridden by Mario Deslauriers at the World Equestrian Games and owned by Wishing Well Farm LLC, tested positive for the banned substance O-Desmethylvenlafaxine (O-D) from samples taken at the FEI Nations Cup Final in Barcelona, October 5-7, 2018. The infraction was reported to the FEI legal department on Oct. 29th. Bardolina 2 is automatically suspended from Oct. 30 to Dec. 29th pending an FEI Tribunal hearing. Deslauriers, 53, who rode for the US for many years before recently switching back to Canadian status, is suspended from competition effective immediately and will not be able to represent Canada in the International division next week at the Royal Winter Fair in Toronto as planned. Jonathon Millar will be replacing him at The Royal. O-Desmethylvenlafaxine (brand name Pristiq, Desfax, Ellefore) is an antidepressant of the serotonin-norepinephrine reuptake inhibitor class primarily used by humans in the treatment of major depressive disorder (MDD). The drug is available by prescription in pharmacies in Canada and the US, and also in Spain. O-Desmethylvenlafaxine featured in a 2014 case in the Canadian racing industry which saw trainer Colin Johnson suspended and fined after O-D was found in his horse’s urine. On appeal, the Racing Commission heard that Johnson’s groom, Yves Tessier, had been taking several prescription medications including O-D and that it was possible the drug was transferred to the horse via sweat, saliva or urine (Tessier often urinated in the horse’s stall). 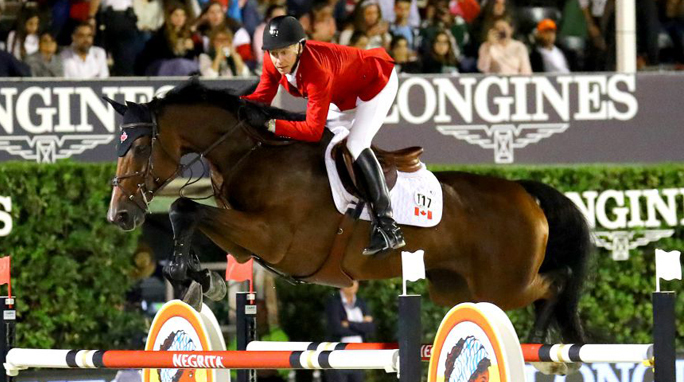 A previous well-publicized case involving one of Mario Deslauriers’ mounts took place in 2012 in the US when the show jumper Urico tested positive for cocaine while showing in Wellington, FL. The Dutch Warmblood gelding’s trainer, Bruce Burr, was suspended for two years, even though Urico’s positive test was likely not deliberate and instead due to contamination. There are several levels of consequence regarding banned substances: horse and rider will be automatically disqualified from the current competition and lose any medals, prizes, or money won; a suspension period of two years can be imposed (which can be reduced if the Person Responsible can show that he/she was not at fault or did not demonstrate negligence); a fine up to CHF 15,000 may be imposed; and the FEI Tribunal may also impose legal costs.